The Indigenous People of Biafra (IPOB) worldwide under the command and leadership of Mazi Nnamdi Kanu wish to draw the attention of the world over the brutal murder of one IPOB family member at Ekwulobia Anambra State today by Hausa Fulani police officers acting on the orders of the Inspector General of Police. The now seemingly regular deployment of terrorists (Nigeria Police) in Biafranland especially in Anambra State since the announcement of election boycott in Biafranland starting from the gubernatorial election come 18th November this year is becoming alarming. IPOB intelligence unit discovered that those posted to Nigeria Army and Police formations all over Biafranland are nothing short of terrorists released and ordered to kill as many civilians as possible in the hope of causing chaos in the country. We want to alert Biafrans, men and women of good conscience across the globe that Federal Government of Nigeria dominated by Hausa Fulani have decided to kill yet another innocent person in Anambra State, in the name of holy war against IPOB. It has been reliably gathered also that Hausa Fulani settlements in Biafraland are awash with police and army uniforms which make it possible for Fulani herdsmen and other terrorists to kill with impunity. 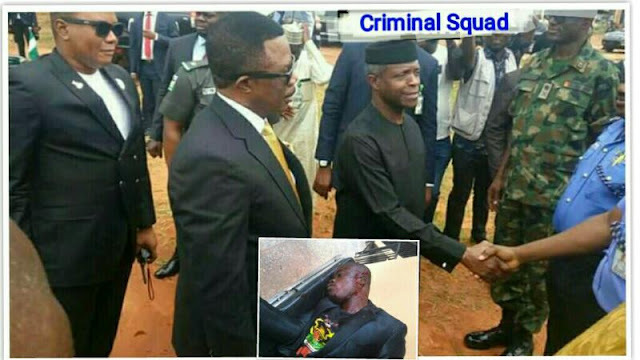 There is a disproportionate amount of Hausa Fulani Islamic police and army officers in Anambra State and other parts of Biafranland who were posted on a mission to kill innocent Biafrans. The order to shoot at innocent Biafrans in Ekwulobia today Wednesday 16th August 2017, came from the Hausa Fulani owned and dominated authorities in Abuja because there is no justification for the barbaric savagery frequently exhibited by the army and police in Nigeria against none Muslims. The entire police and army personnel in Anambra State today are now staffed and manned by exclusively Hausa Fulani Jihadists hand picked by Inspector General of Police and Chief of Army staff. We are also aware that the new terrorist group posted to Anambra State with the Police and Army uniforms by Nigeria Government dominated by Hausa Fulani Oligarchs were sent to terrorise Biafran populations in the hope of intimidating us into silence the same way Northern ethnic groups have been beaten into a state of submission by the Fulani hegemonic juggernaut. With IPOB they have failed woefully because our leader Mazi Nnamdi Kanu will be in Ekwulobia Aguata LGA of Anambra State on Sunday to commiserate with the families of the victims of these latest Hausa Fulani terrorist outrage carried out by the Nigerian Police. The frequency of wanton brutality and cold blooded murder in Anambra State in recent times orchestrated by the Hausa Fulani dominated armed forces is legitimised ethnic cleansing because these crimes are being sanctioned by the highest office holders in Abuja. We are holding the DPO of Ekwulobia Police Station directly responsible for the murder of IPOB family member murdered by men under his command. Also responsible are those faceless individuals hiding behind non-existent lawyers association in Anambra State that gave Hausa Fulani's the moral impetus to embark on this latest round of murder. We are fully acquainted with the fact that the Federal Government of Nigeria and her Hausa Fulani oligarchy have perfected plans to continue using the attack and crisis on the citizens especially the IPOB members in Biafranland with those in Anambra State to divert the attention of well meaning Nigerians and around the world who are asking questions about the constitutional calamity the absence of Major General Muhammadu Buhari is causing at the seat of power in Abuja. The Nigeria Government and her security operatives continue to bring acts of terrorism to the people of Biafra which we are morally bound to resist. Humanity must stand up now in unison to stop this state sponsored terrorism before it is too late.